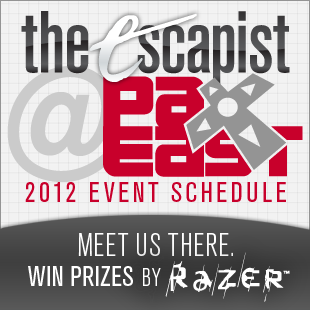 The Escapist has a lot planned for PAX East this year! We here at The Escapist are packing our bags and getting ready to head on north to Boston, Massachussets for this year's PAX East, and we're excited to announce that we'll be hosting tons of cool events for you to check out! From panels covering the basics of D&D to career advice on joining the game industry or becoming a freelance journalist, there'll be plenty of chances for you to hang out with fellow fans of The Escapist and meet some of The Escapist crew. And don't sweat it if you end up missing out on some of our events, as we'll be doing our best to record our panels so you'll be able to listen to them right here The Escapist. One event you don't want to miss is The Escapist's Movie Night on Friday at 10:30, featuring MovieBob, the stars of LoadingReadyRun, and more! Attendees will also have the chance to win prizes provided by Razer (which you can follow on Twitter at @CultOfRazer) and check out a brand new episode of our newest series, Space Janitors! Here's the full schedule of programming that The Escapist will be hosting at PAX East this year. We look forward to seeing you there, and definitely feel free to say hi! Is gaming a threat to your mental health? What constitutes healthy use, and what do psychologists think of as obsession and even addiction? What questions do gamers have about the psychological impact of the hobby? Mark Kline, PsyD is Clinical Director of the Human Relations Service in Wellesley, MA and has responded to questions about gaming and mental health through his column at The Escapist, AskDrMark. He will discuss his work with gamers and their families and his own experiences in gaming. Ever wanted to try out a tabletop RPG, but found all those rulebooks and funny-shaped dice to be just a little too intimidating? Then check out this panel to learn all about the basics of tabletop RPGs! 3:00 PM Stuff Your Criticism, I Want A Review! Is there a difference between a game review and game criticism? Do you expect reviewers to talk about why a game is important in the annals of development or do you just want to know whether it's worth your $60 or not? Should game reviewers even CARE if you're going to purchase a title? As the video game media matures along with video games themselves, the purpose of a review isn't as clear as it once was. Come hear what a panel of experienced reviewers and games media pundits have to say about these questions, and then let them know what *you* want out of your game reviews. 4:30 PM So You Want to Get into the Game Industry? So you want to get into the gaming industry? There are job opportunities not just in design, programming, and art - but for testers, marketing and PR, trade show coordinators, community managers, office managers, and more. Learn what skills are needed, what tasks are involved and how to apply. 6:00 PM The Blankety Blank Panel! Get ready to match the stars! Join a hilarious collection of writers, pundits, and comedians for PAX Game, the live version of classic TV game show Match Game. Members of the audience will be selected as contestants and challenged to predict how the panelists will answer excessively silly questions. Whoever matches the most answers wins! For a raucous evening of raunchy fun, stop by - and bring your sense of humor. Create a whole adventure in an hour! Even if you've never DMed or played D&D, you can still participate in mass-brainstorming with your fellow gamers. We'll take suggestions from the crowd for colorful non-player characters, terrifying monsters, as well as the big bad guy and weave them all into a complete dungeon-delving adventure. Join experienced RPG designers from Wizards of the Coast, Margaret Weis Productions, White Wolf and more as they help pick ideas for the adventure we design together. 10:30PM The Escapist Movie Night! Meet the stars of The Escapist's LoadingReadyRun, Movie Bob, Editors and more at The Escapist's Movie Night! You'll see never-before-seen videos from The Escapist's most popular web series, including the series premiere of our newest show, Space Janitors! Making a successful go at being a game journalist involves more than just good ideas and proper grammar. If you're interested in game journalism, this panel should not be missed! A PAX tradition! LoadingReadyRun (producers of Unskippable, CheckPoint, Feed Dump and Desert Bus for Hope) lead a Q&A panel featuring brand new videos. Then the evening continues with a screening and live commentary block. Come hang out! 1:00 PM Admit It - You Play Social Games. Let's Talk About Them. Social games are like the HPV of the video games industry: At least 50% of us are infected, even if we show no symptoms. Unlike that awful sexually transmitted disease, however, social games don't cause cancer, embarrassing skin blemishes or awkward phone calls with exes. They're actually fun-so come to this panel and learn how the best social game devs are helping the rest of the industry make better video games.